The neighborhood in Brgy San Roque, Talibon, Bohol was shocked by the brutal killing of a grandson to his 86 years old grandfather. The case happened at 6 in the morning in the said barangay, whilst the victim, Simplicio was only sitting outside when his grandson without any warning gored him with an old, rusty jungle bolo. The suspect’s father, Reynaldo, said when he saw the dreadful incident, he tried to stop his son, however he was malevolently warned that he will be next. According to the local police, the 30 year old suspect, a former security guard, was high on drugs and was hallucinating that his grandfather was a paranormal creature. 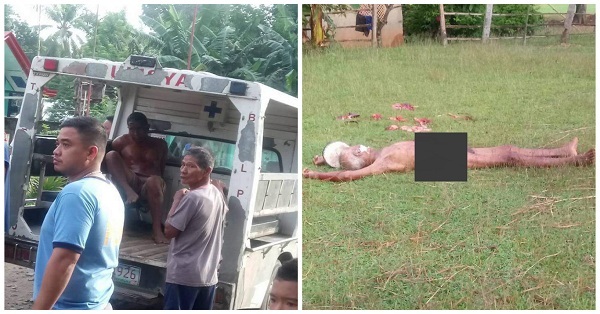 After being stabbed, the victim was dragged by his grandson in an open field where he was killed, not yet contented on what he did, the suspect even opened the body of his grandfather and scattered his internal organs. Finally caught, the suspect confessed he was using drugs and was not aware of what he was doing. Family members did testify that they did not see this coming happening as the suspect was not into criminal activities. In line, with the current government’s advocacy, War Against Drugs, netizens were really upset by this news, and are eyeing on Commission of Human Rights and CBCPs mingling. Drug addiction has been prevalent in the Philippines for many decades, and has caused destructive outcomes in the country. Drug addiction especially to the most common, Methamphetamine, can cause hallucinations eventually leading to schizophrenia.